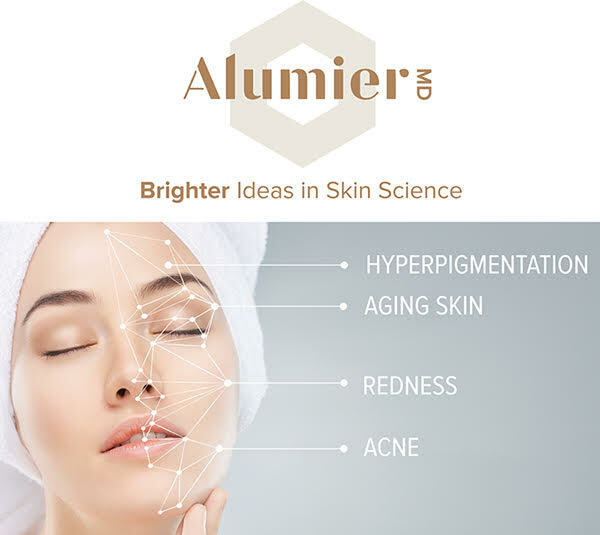 AlumierMD was created by a team of experienced PhD biochemists, physicians and skin care specialists to develop scientific formulations using innovative ingredients at optimal levels within advanced delivery systems. The result is optimal skin health and an excellent client experience. Innovative Ingredients – the highest grade of ingredients at the correct percentages proven by clinical studies. Advanced Delivery Systems – the delivery system enhances the ingredient either by keeping it fresh, providing synergy or increasing absorption. Integrated Professional Treatments and Home Care – the brand seamlessly integrates these 2 entities by using similar as well as synergistic ingredients. Through advanced proprietary chemistry, AlumierMD has optimized the bioavailability of each molecule in our ingredients. As a result, our scientific formulations deliver exceptional results, all while being free of parabens, sulfates, petrolatum, mineral oil and dyes. Science-based, high-performing ingredients and an individualized approach? That’s AlumierMD. Partner our products and treatments with the knowledge of a skin care professional and you’ve got the perfect combination. Let AlumierMD and your skin care professional help you look and feel like the best version of yourself! by exfoliating dead skin cells and speeding cell turnover. This multipurpose resurfacing peel reduces acne, pimples and minimizes the appearance of fine lines and wrinkles, large pores, hyperpigmentation and sun damage. Glow Peel combines lactic acid, salicylic acid and resorcinol, creating a multipurpose resurfacing solution effective in minimizing the appearance of fine lines, wrinkles and hyperpigmentation issues like age spots, discolouration and uneven skin tone. This formula exfoliates dead skin cells and stimulates cell renewal. To suit individual needs, Glow Peel can be customized by strength by numbers of layers. This peel also includes the Enzyme Retexturing treatment and an application of our Vitamin A boost.